This year we spent Christmas on Oahu. Just had a small gathering with a few of our friends and neighbors. We missed our extended family, but it was still one of the best Christmas seasons ever. People in Hawaii are suprisingly festive, despite a lack of cold weather, and there are many events for the entire month. Most, if not all, of the holiday traditions on the mainland are followed here in Hawaii. Especially when it comes to food. Nothing says Christmas Dinner more, to me, than Prime Rib. I have nothing against turkey or ham, but these are my favorites only for Thanksgiving. Something a little more special is perfect for Christmas. Delicious, savory, satisfying … just as good for left overs. Prime Rib on Christmas has become a tradition in our home and one well worth continuing. When you taste this recipe, I think you will agree! 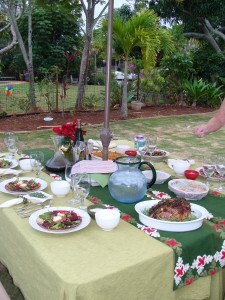 Christmas Dinner – Island Style!! Cut top 1/2 inch off of two garlic heads, drizzle with olive oil and then bake 2 heads Garlic at 350 degrees for about 40-45 minutes, until soft. Can be done in advance. Let cool. Squeeze the insides of each clove of baked garlic into food processor bowl. You should have around 30-40 cloves of garlic. Cream garlic together with prepared horseradish and 2 TBSP fresh chopped rosemary. Before cooking, pat roast completely dry. This well help the meat sear. Liberally salt and pepper all sides of the roast. Heat 2 tbs olive oil on med-high heat in heavy stainless steel or cast iron skillet. Place roast in heavy pan and sear each side (all sides) for about minutes each, until browned. Remove meat. Deglaze pan with 1/2 cup red wine. Remove liquid and bits and reserve for later. Pre-heat oven to 450 degrees. Get out large roaster pan with rack. Spread garlic-horseradish mixture thickly on all sides of the seared meat with a spatula. Press and spread three bunches of herbs into bottom crust of roast. Lay roast on roasting rack. Press remaining three bunches of herbs into top and sides of roast. Place several pats of butter on top of herbs on roast. Pour in 1 box of beef stock and the reserved liquid from deglazing. This can all be done in advance, if desired, and the meat refrigerated overnight, but you MUST let roast come to room temperature prior to cooking (this may take up to 2 hours). Make sure roast is at room temperature. Place roast in the oven. After 15 minutes, turn heat down to 325 degrees. Continue to cook. Cooking time will depend on exact weight of roast and doneness desired. You will need a meat thermometer to test. I recommend checking the internal temperature after 1 hour, no matter the size of the roast, just to check progress. Also, every 1/2 hour, check beef broth at bottom of pan to ensure that it has not dried up or burned. Continue to add more broth or water, if necessary, so that you have about an inch of liquid at all times. When the roast reaches the desired doneness (temperature), remove from the oven. After you take the meat out, cover loosely with foil and let rest for 25-30 minutes, during which the meat will continue to cook a bit more. For Rare meat, the thermometer should read 120-125 degrees, when inserted into the center at the thickest part of the roast, not touching any bone or fat. Medium-rare is 130-135 degrees. Medium, 140-145 degrees. Medium-Well, 150-155 degrees, Well-done, 160 degrees or more. As an example, a 5 pound roast will take about 1 hr to 1 1/4 hrs total in the oven for Rare. A 10 pound roast will take about 2 to 2 1/4 hrs for Rare. Cooking times may vary greatly, so please use a thermometer. You do not want to ruin this gorgeous and expensive cut of meat. Remove all the pan drippings from the roasting pan, combine with any juices which have settled from the resting roast. Bring to a boil, reduce heat and simmer, slightly thickening the liquid. Salt and pepper to taste. Serve with and drizzle over meat. Looks fun and delicious. 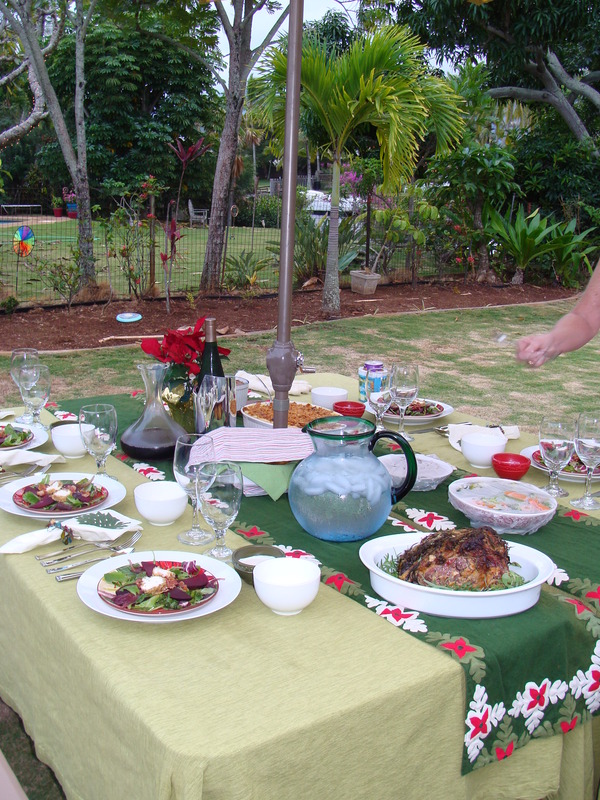 Only in Hawaii can you have Christmas dinner in the backyard! You’re right, it was a beautiful day! Thanks for this excellent read. I liked every bit of it. I linked to this and will be reading again. What a hit with my friends. Thanks for making me a star. Thanks for post! I like your site a lot!